This is the story of Wanda Hjort Heger. Wanda, a 21-year-old Norwegian watched the Germans occupy her country. 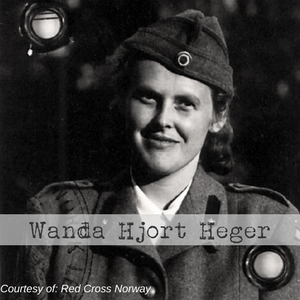 In October of 1942, Wanda and her family were forced to leave Oslo due to her parents’ work in the Norwegian resistance movement. They were forced to live under house arrest in Gross Kreutz, just west of Berlin. Wanda’s grandmother was of German descent and from an old noble family and Wanda’s two aunts were married to counts in Germany. Due to their connections, the family was kept out of the regular prison system. Through contacts in the Norwegian church in Hamburg and the Danish church in Berlin, Wanda learned about a growing population of Norwegian prisoners in Sachsenhausen. She and her siblings packed food supplies and traveled to the camp gate, telling the camp guards they had packages for the Norwegian prisoners. Among these supplies were two glass jars of potato salad. Since glass jars were in scarce supply, they said they would be back to pick up the empty jars in a week. This began a weekly routine that led to familiarity with the camp guards. Over time, Wanda was able to pass messages to the Norwegian prisoners working at the package sorting facility. These messages enabled Wanda and her family to compile lists of Norwegians held in captivity. These lists were sent to the Norwegian government-in-exile and were essential for the success of the Swedish Red Cross and the White Buses operation. The White Buses operation saved over 15,000 prisoners of various nationalities including Danish Jews. It is remarkable how something as simple as jars of potato salad led to the rescue of thousands of victims.